When was the last time you had an “aha” moment? That’s how customers describe our Gradient Assessment after they’ve reviewed the detailed report of more than 40 different metrics. 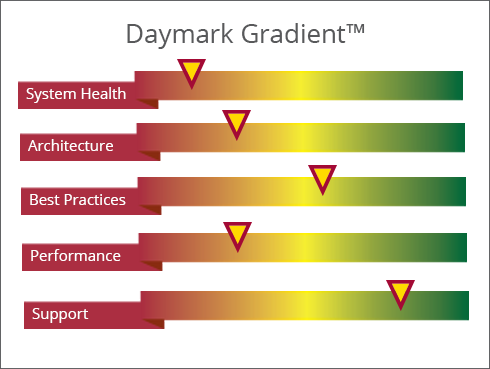 Even customers who thought their environment was stable and secure told us that the Gradient Assessment was eye-opening, and said they gained critical new information about their data, processes, and systems. Customers appreciate that we uncover inefficiencies and prevent catastrophic failures before they disrupt their company’s IT infrastructure and business apps. Our experts dive deep into each of these areas and provide rankings and detailed long- and short-term recommendations based on their findings so you can prioritize your next steps for creating a healthy and efficient IT environment.